I’m knackered. My knees are stiff and I can hardly stand. We left Thorong Phedi at 0415 to find that already there was a train of head torches along the path. It was rather eerie as all the snow on the mountains appeared to be glowing in the moonlight. The moon and stars were all out in force - I comforted myself in being able to locate the North Star for the first time on this trek. I think I’m getting better at sorting out the wheat from the chaff in these overcrowded night skies. It was hard work climbing up, but we still managed to overtake groups. Once we got to the snow the wind picked up and made everything very cold. I still had my headache but it hadn’t deteriorated so I continued on. The way to Thorong La is filled with false summits, I resorted to not looking more than 2m infront of me so I wouldn’t get too disappointed. After about 30mins on the snow the sun rose and about 30mins later it showed it’s face above the surrounding mountains. 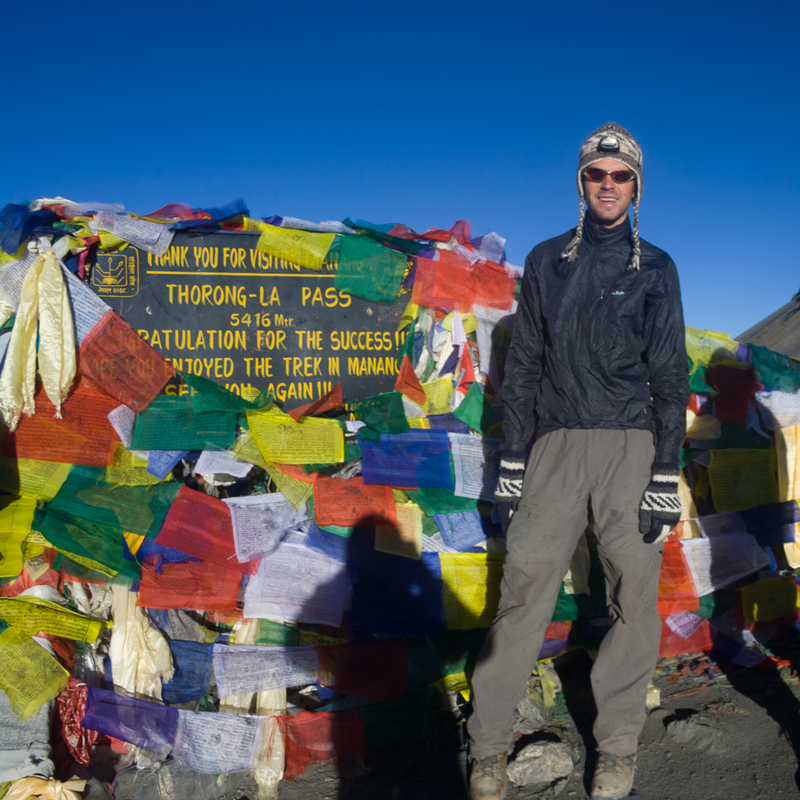 We arrived at the top of Thorong La (the highest mountain pass in the world) at 0715. According to Trailblazer’s guide book: You’re now standing on the equivalent of four Ben Nevises, 2¼ Mt Kasciuskos, 1½ Mt Cooks and you’re 938m / 3077ft above the Matterhorn and 608m / 1998ft higher than Mont Blanc!" I think that’s pretty cool. By this time we were only the 4th team up there that morning. I took a few photos of the large sign and me and a few of the mountains, but I wasn’t in the mood for a prolonged stay as I was cold and I still had my pulsating headache which seeming to throb whenever my foot came down hard on the scree / frozen snow. Consequently we left fairly quickly with the typical morale-induced brisk walk off the summit. 5 minutes later we were the 1st group of the day. The change in pace quickly warmed me up. For the record I still had my insulation jacket in my bag if I needed it. What followed was uncalled for quite frankly. The 1600m descent on the other side was in the style of zig-zagging paths entrenched in scree slopes. These get annoying and tiring after a few hundred metres along so the prospect of 1600m down wasn’t motivating. I found it hard work, hence the opening comment about my knees. I took it all slowly and tried to save what little energy I had left. We stopped off at a teashop for a major rest after about 2 hours and consequently we were the 3rd team into Muktinath by 1100. Still, we shaved over 2 hours off the standard time - quite good I think. Muktinath is lower than Yakkharkha so my AMS symptoms are disappearing pretty fast. This side of the pass is very cold and desert like - hardly any vegetation what-so-ever. 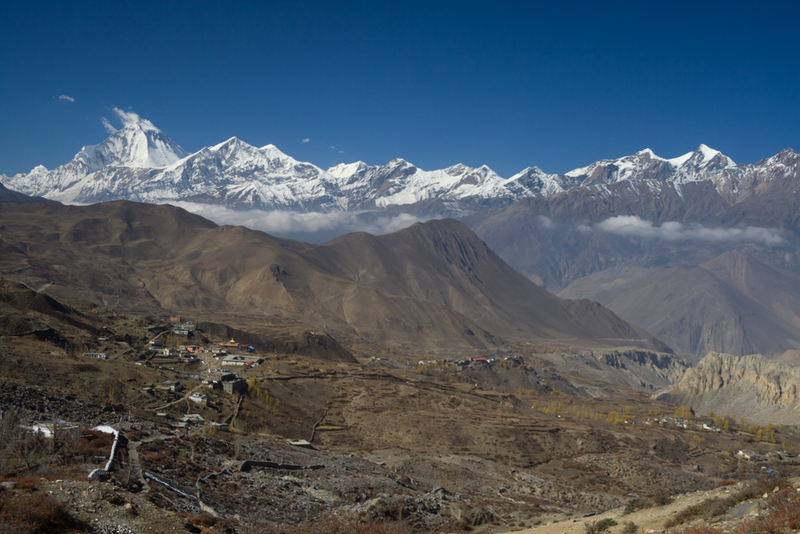 You can also see Dhaulagiri which stands at 8167m, very impressive. This afternoon I’m going to take it very easy as I still have a week’s worth of walking before Pokhara. Dawa took me to the temple at Muktinath which is a place of pilgrimage for Hindus. There is a natural gas vent coming out of the ground which is alight, close by is a stream. Hindus find this Holy as they see it as the location of 3 elements together: earth, fire and water. There is no wind there as they’ve built a temple on top if it.